Birthday Party Magic Shows by Comedy Magician Amazing Jeffo, The Blind Magician! 3-5 year olds are at a great age to introduce to the world of "magical" things. This show emphasizes amusing plot lines and stories expertly mixed in with the magic to grab the attention of the littlest child. Jeffo gets everyone involved, shouting out funny magic words and movements to make the magic "happen"! Early elementary age children get a real sense of "accomplishment and thrill" when they help Jeffo make all the magical moments happen right in their hands! Throughout the show, Amazing Jeffo delights the children with his appealing brand of silliness. All the while, they’ll be learning "valuable, character-building lessons". 10-13 year olds are "sure they know" just how the magic is accomplished. But Jeffo surprises and delights the kids with the "unexpected"! 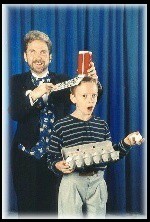 The children will not only be amazed by the result of the magic trick but all the fun stuff that happens along the way. Because this age enjoys a "challenge", Jeffo also offers the group an option of a mini magic class after the show! The class only lasts approximately 60 minutes so you have plenty of time for cake & ice cream! The Birthday child is presented with their very own Magic Set! All other children receive stickers and party favors to enjoy long after the show! Each birthday show is tailored to the age level and interests of the Birthday boy, girl or adult. Additional birthday products and activities are optional, making for even more "hands-free" time for the host. After watching Jeffo’s show, The Birthday child will get their own opportunity to become a magician, thanks to the free magic set that comes with every birthday booking. Others attending the party also have the option of receiving a "Jeffo’s Bag of Tricks," filled with easy-to-perform tricks. You choose the type and amount of tricks in each bag. Several price options are available. These serve as an activity and a tangible take-home reminder of the great party you hosted. Any of the packages can include a combination of a magic show and/or, a magic class. Birthday Shows and classes average 30 - 60 minutes. "Thanks again for attending my son’s birthday party on Saturday. The kids really enjoyed your program (as did the adults). My son has been playing with his magic trick set ever since you left - just loves it - so thank you for that too." ~ Just Call and Ask! Celebrating 20 years, over 3000 magic shows! All ages love the idea of having a special day all for themselves, a time where all the attention is focused on them. It’s a lot of work to host a birthday party. Make it easy on yourself. You can enjoy the party just as much as the guest of honor and be assured they are the star for the day. 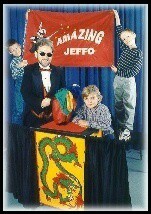 Amazing Jeffo, a magician who happens to be blind, will keep the party-goers attention throughout the show. 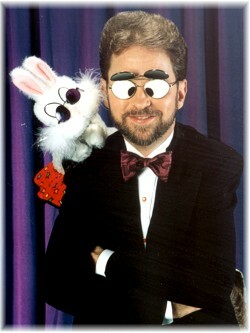 His special blend of magic, music, stories, stunts, gags and more engage all and leave your audience members wanting more! Not only will they be amazed by the tricks but will be in wonder as to how someone without eyesight can pull the wool over their eyes! Entertaining an audience comes so easily to Amazing Jeffo; he can do it with his eyes closed. Volunteers are called up throughout the show and help Jeffo do the tricks, including special tricks reserved for the birthday person. All ages naturally relate to Jeffo because of his playful manner and easy-going charisma. "I think kids feel a natural bond with me for many reasons: my modest stature and appearance of vulnerability, my difficulty, of course, with the printed word, my sometimes silly behavior around adults, my inability to drive," says Jeffo. 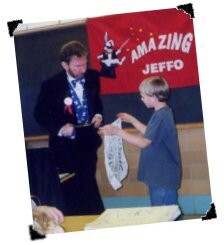 Amazing Jeffo also tailors birthday programs for ALL ages! Wayne Schmidt, 40th Birthday, Inver Grove Heights, MN, "I didn’t know what to expect! This was fantastic!!! Jeffo you made my 40th birthday party one to remember and I learned some important lessons from you! Thanks!" Create a birthday memory to last a lifetime. Initially, the audience is wowed by the magic and laugh their socks off at the jokes but they also leave with a valuable life lesson: through Jeffo’s gentle and disarming approach they’ll "accidentally" learn about the ability of people to overcome challenges in their lives. Their eyes will be opened to the concept of people’s differences - all done in an entertaining style. Birthday shows are specifically tailored to the age level and interests of the Birthday person involved. Additional birthday products and activities are optional, making for even more "hands-free" time for the host. The Birthday person instantly becomes a magician after receiving "Jeffo’s Bag of Tricks," filled with easy-to-perform magic. Your younger guests can also receive magic party favors and other toys. These serve as an activity and a tangible take-home reminder of the great party you hosted. If desired for younger audiences, a magic show alternative is available in the form of Magic Class instruction. Children are provided with all necessary materials. Several price options are available. A combination of a magic show and a class may also be arranged. 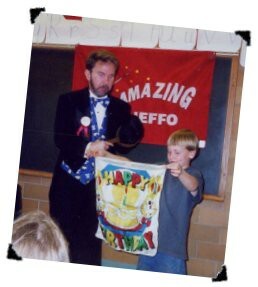 Celebrating 20 years of illuminating performances, Amazing Jeffo appears at birthday, school, church and corporate events. Contact Jeff Smith, aka Amazing Jeffo, today for available dates! 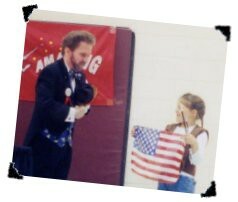 Not Just for Birthdays Anymore...Magic Shows for Other Special Events! Budget-Friendly Events ~ Just Call and Ask! Birthday parties, corporate events, weddings ... you name it, The Amazing Jeffo can handle all of your entertainment needs. His mission is to amaze people, amuse people, and let people know that blindness isn’t a tragedy. Blind people are just like anybody else, they simply can’t see with their eyes. The Amazing Jeffo has performed at everything from birthday parties to scouting functions to Lions Club banquets. 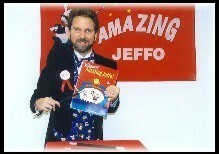 Whatever your occasion, Amazing Jeffo has the magic to suit.